Louis Armstrong is the most important musician in the history of jazz. He is its greatest trumpet player. His trumpet playing influenced every musician on every instrument who came after him. His singing changed every jazz singer after him. Without his influence, there might be a music called Jazz but it would not be what it is. Louis Armstrong was told and he believed that he was born on July 4, 1900 in New Orleans, Louisiana. Jazz is America's gift to the rest of the world and our only native art form. The most influential jazz musician should have been born on America's birthday at the turn of the century. He was really born on August 4, 1901. He grew up in the poorest and roughest part of New Orleans which was known as the "battlefield". He was raised by a single mother who worked as a prostitute (which was legal then in New Orleans). When his mother was absent, he stayed with his paternal grandmother. It was a hard life in dire poverty and he was a youngster who hustled money for food by delivering coal and doing other odd jobs in the red light district. In 1913 Armstrong was arrested for firing a gun into the air to celebrate New Year's Eve and was sent to the Milne Home for Colored Waifs. Although this has been described as a reformatory, it seems to have been more of a group home. He was placed in the band of the Home on tambourine and moved to bugle and then to cornet. He very quickly mastered the cornet and when he left the Home for Colored Waifs he began playing cornet in street bands in America's most musical city. His idol and mentor was Joe "King" Oliver who played cornet in the best band in the city - the band led by the trombonist - Kid Ory. This was the time of a huge exodus of black people from the South to northern cities in search of better job opportunities and less racial discrimination. When King Oliver joined that exodus he recommended Louis Armstrong to take his place in Kid Ory's band. Satchelmouth (an early nickname) played in that band and in many other New Orleans bands. This included playing on riverboats in bands organized by Fate Marable. Riverboat playing required reading the music for many unfamiliar songs and Louis quickly learned reading music. He had offers to leave New Orleans to play which included an offer from Fletcher Henderson. He turned them down. But, when King Oliver asked him to come to Chicago in 1922, he went. In June 1922 he traveled to Chicago to join his idol, King Oliver. After playing in Chicago for four years, King Oliver had started playing at a large new club called the Lincoln Gardens Café. His Creole Jazz Band consisted of Bill Johnson on bass, Honoré Dutrey on trombone, Johnny Dodds on clarinet, Baby Dodds on drums, Lillian Hardin on piano, and King Oliver on cornet. 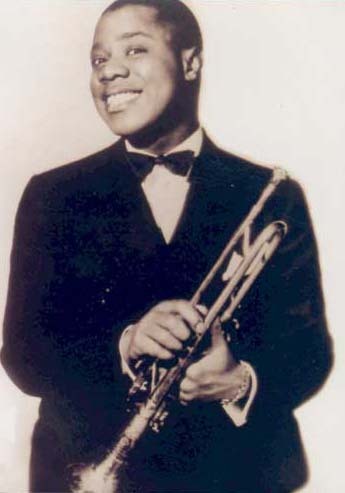 Louis Armstrong joined as second cornet. The Creole Jazz Band was the hottest and most popular band in the city of Chicago. This was New Orleans ensemble style jazz at its finest. The cornet played the melody; the clarinet played counter melodies above the cornet; the trombone played counter melody and bass below the cornet. The rhythm section created a foundation for all of this. While staying within each instrument's role in the ensemble, the musicians jointly improvised songs. Individual instruments took short breaks but did not dominate a song. Armstrong played apparently jointly improvised harmony to Oliver in the cornet breaks. The Creole Jazz Band was recorded in 1923 using the early acoustic method for recording. The sound quality of the recordings is poor and the drums and bass are mostly missing due to recording limitations. Listening to a song such as "Chimes Blues" one hears the musicians firmly attached to the ground beat -playing in a stiff and wooden manner. One of Louis Armstrong's first recorded solos is on "Chimes" and although he does not improvise, the tone and rhythmic feeling that he would develop into a virtuoso are clearly present. This band represents both the high point and the beginning of the end of the dominance of collective improvising in jazz. Louis Armstrong's development beyond this music changed all of jazz. King Louis (2005) - This 4 CD set includes the sides Armstrong recorded with King Oliver as well as his Hot Fives and Hot Sevens recordings. The Hot Fives & Hot Sevens recordings are widely considered the most important recordings in the history of jazz.